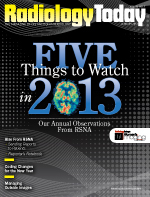 A session at RSNA 2012 discussed how the practice is growing—and that radiologists’ concerns about providing reports directly to patients really haven’t come true. Here’s convention: The physician refers a patient for diagnostic imaging to help diagnose his health issue. The radiologist reads the scan and sends the report to the referring physician. The referring physician reports the results to the patient in a few days to a week. Here’s the future: The patient undergoes an X-ray, CT, MRI, or other diagnostic imaging exam. The radiologist reads the scan and uploads his report to the patient’s EHR. The patient accesses the radiologist’s report through a secure portal on the Internet at the same time as the referring physician or soon after. At many hospitals and imaging facilities, especially academic centers, this shift in practice already has begun. “It’s slowly happening that patients are being given direct access to their radiology reports,” says Leonard Berlin, MD, of the department of radiology at Illinois’ Skokie Hospital, part of the NorthShore University Health System. Many in radiology expect the pace will continue to accelerate as more hospitals and healthcare providers work to meet the Obama administration’s incentives for making all patient health records electronic by 2014. Like most changes in medical practice, the change in radiology reporting convention comes with some controversy. However, early reluctance seems to be giving way to acceptance as the key concerns some conventional radiologists had about giving patients direct access to reports aren’t proving true. “The articles coming out at institutions that have instituted direct access have been very positive from the institutions’ point of view and the patients involved,” Berlin says. Berlin and Annette J. Johnson, MD, a radiologist at Wake Forest Baptist Health in Winston-Salem, North Carolina, were two of the four panelists for the RSNA 2012 presentation “Providing Reports Directly to Patients: Should You Do It?” Berlin says the topic fit the “patient first” theme of the annual meeting. By providing reports directly to patients, Berlin explains, radiologists can become more involved in their patients’ treatment decisions, as he believes they should. The days when doctors make unilateral decisions about patient care are long past, which is one reason for the change in reporting convention, he says. Johnson believes the shift in practice has come about because we live in an information age. Patients have easy access to information and take advantage of the Internet to learn more about their health and take a more active role in it, she says. She believes it’s good for radiologists to provide reports directly to patients and agrees that the practice encourages patients to be more involved in their care. Initially, for various reasons, some radiologists were opposed to providing their reports directly to patients. One of the naysayers’ biggest concerns was that patients wouldn’t be able to understand the content of the reports and could easily misinterpret the results for the worst. “A patient could see in his report that he has a renal cyst and think, ‘Oh my god,’ when it’s really nothing to worry about,” says Richard Taxin, MD, a radiologist at Crozier-Keystone Health System near Philadelphia. Taxin played the devil’s advocate at the RSNA panel. Radiologists also feared they would be bombarded with patients calling in a panic to discuss the results. “Radiologists were concerned that they wouldn’t be able to get their work done because they would be answering calls from panicked patients all day long,” Berlin says. But neither concern appears to have played out that way at institutions giving reports directly to patients. Penn Medicine in Philadelphia began a pilot program in January 2012, releasing only a few exam types at a single hospital after a seven-day delay. Since the program was started, “We saw no change in patient calls to clinics or to radiologists, and we received no complaints from patients,” says Curtis P. Langlotz, MD, PhD, a staff radiologist at Penn Presbyterian Medical Center and the Hospital of the University of Pennsylvania who moderated the RSNA panel. The Penn pilot program was so successful that now all reports at all the facilities in the health system are released via a Web-based portal after three business days, Langlotz says. “We release about 1 million reports a year,” he says, and no one has seen any corresponding increase in patient calls as a result. The concern that patients wouldn’t be able to understand the reports hasn’t seemed to come true either. Thanks to the Internet, Berlin says, many patients do their own research, and “it isn’t long before they know more about their disease or condition than the doctor does.” While it’s true that there’s a lot of misinformation on the Internet, Berlin adds, patients seem to do a good job sorting through it and will talk to their doctor about what they find. Yet another concern about giving patients direct access to reports is that it would cause referring physicians to lose some control in the patient-physician relationship. As with the other concerns, this one really hasn’t come true either. Giving patients access to their radiology reports hasn’t stopped them from discussing the reports with their doctors, Berlin says. The radiology report is only one piece of the puzzle, and patients recognize that their doctors have the other pieces, such as medical history, symptoms, and physical exam. Their doctors are the ones who can put all the pieces together to reach a diagnosis and suggest treatment options, he says. Johnson says Wake Forest has explicit instructions on its portal encouraging patients to discuss the results of their radiology reports with the ordering physician, who is clearly identified on the report. Taxin says he is comfortable talking to patients, especially breast cancer patients, and likes to tell them what he believes their situation is before they leave his office. Langlotz says Penn Medicine’s system automatically sends patients an e-mail when their reports are ready. It has a three-day delay built in so that the ordering physician can review the reports before the patients. Additionally, another concern about this new practice was the possibility of more lawsuits. While patients can sue for anything, Berlin says he’s unaware of any lawsuit stemming from a patient having a heart attack or an anxiety attack after reading one of his reports and learning something is seriously wrong. “That’s nonsense,” says Berlin, who has written more than 300 articles on issues surrounding ethics and physician liability. If anything, he says the practice might help eliminate errors that could lead to litigation. But radiologists have been sued because patients weren’t told about the results of their diagnostic imaging exam, according to Berlin. “Unfortunately, there are instances where things like this can fall through the cracks,” he says. Providing patients with direct access to their reports can help eliminate this potential issue. About three years ago, a Pennsylvania state representative proposed a bill that would require radiologists to send reports of all exams directly to patients. The representative was the friend of a lawyer who was outraged when his wife wasn’t told of her cancer findings and died, Berlin says. The bill never went anywhere. Berlin says the Pennsylvania Radiological Society, among others, opposed the bill because members feared patients wouldn’t be able to understand the reports. Taxin says there also was opposition because the complex bill was poorly written and would have been costly for radiology practices and hospitals to implement. Since 1999, when the Mammography Quality Standards Act was enacted, facilities are required to send a summary of the mammography report to patients. “Since the law went into effect, I’ve never seen a lawsuit where a woman is suing because she wasn’t told she had breast cancer,” Berlin says. Patients seem to welcome receiving their results directly. Johnson conducted a study where she asked patients to complete hypothetical clinical simulations to see whether they wanted to have direct access to their radiology reports, even if the reports contained bad news. The study, published in the Journal of the American College of Radiology in April 2012, found that most patients wanted the reports regardless of what the radiologists found. More than 60% of those surveyed said they wanted immediate access to their radiology reports when the findings were normal. About one-half (47.2%) said they wanted immediate access if the findings were seriously abnormal, and 45% said they wanted immediate access if the findings were inconclusive. According to Johnson, the patients also said that if they didn’t understand the reports, they would take steps to have them translated into lay terms. Some said they would do their own research on the Internet; some said they would ask friends and family who were more knowledgeable about medical terms. Most said they would talk to their doctor about the results. Patients also said they found a direct link to the National Library of Medicine to be helpful and would use it to research terms they didn’t understand. Based on this research, Johnson believes patients are more resourceful than some radiologists believe. She thinks most patients would be able to handle whatever information they discovered by reading their radiology reports on their own. Johnson shared an example of one woman who didn’t speak much English but still wanted access to the written report because she would have her daughter, who wanted to be a doctor, help her interpret it. “My viewpoint is our society is very well educated, and it’s insulting to say patients aren’t going to understand it,” Berlin agrees. One argument in favor of giving patients direct access to their radiology reports is that they can get answers sooner. In her study, 80% of patients said they would prefer to get their results within three days rather than waiting for their doctor to call them, even if it were bad news, according to Johnson. Knowing that patients can access their radiology reports, some radiologists have changed the way they write them. For another study, Johnson held focus groups with radiologists, referring physicians, and patients. She learned that patient perspectives on access to radiology test results differed significantly from physician perspectives. Both referring physicians and radiologists, who had multiple concerns about patient access to reports, were reassured that no serious issues had been reported at Vanderbilt University in Nashville, which has been providing its reports directly to patients for several years. Since late September 2012, Wake Forest Baptist Health has been providing its patients with direct access to their radiology reports. Knowing that patients will see her reports, Johnson says she tries to make them as straightforward and clear as she can. “I don’t put anything unimportant, such as incidental findings, in the conclusion,” she says. The US Department of Health and Human Services has proposed requiring patients be given direct access to their laboratory tests. It won’t be long, Berlin believes, before everyone is required to provide patients with their imaging reports as well, and it will be to the benefit of radiologists, medicine, and patients.